This site will provide you with the most up-to-date information about the Bordesley Abbey Project. The main focus of the Bordesley Abbey Project is currently post-excavation analysis and publication of the results of extensive excavation and fieldwork. Three monographs have already been published - on the excavations of the south transept and chancel/crossing/choir of the abbey church and of the abbey's metalworking watermills and workshops - and numerous articles. A draft report of Excavations in the eastern cemetery has been prepared and a study of the chapel, The gate chapel of St Stephen, is in progress; post-excavation work on the choir/nave/aisles is at the archive stage. Research on the granges continues. 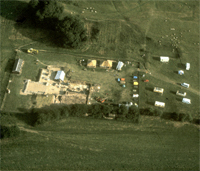 2006 saw the completion of an assessment of the remaining unpublished excavated areas of the abbey (in the church, cloister and eastern exterior cemetery) and of a project design for the analytical phase of post-excavation and publication. This 53,000-word assessment was supported by English Heritage and Redditch Borough Council. A report on the grant received in 2001 from the Royal Archaeological Institute: Tony Clark Memorial Fund for Archaeological Science for scientific analysis of decorated tiles is here. The work of the Bordesley Abbey Project over more than thirty years is summarised in the illustrated review (2000) by the project's directors, Grenville Astill, Sue Hirst and Susan M Wright, which follows.A revised and updated version of this paper appears in volume 161 of the Archaeological Journal for 2004, published in 2005. This review supersedes the 1989 project summaries (by Astill and by Hirst and Wright) in The archaeology of rural monasteries (ed R Gilchrist and H Mytum, Brit Archaeol Rep 203). Published in 2006, in a special issue of Cîteaux on tombs and benefactors, was 'Patronage, memorial and burial at Bordesley Abbey’, by Wright, Hirst and Astill: Cîteaux – Commentarii cistercienses / Cîteaux Commentarii cistercienses 56 (fasc 1–4) for 2005, 353– 62.